Bacon on the beech: Baking on the Beach. For the next ten days we will be baking on the beach in Lanzarote. Lanzarote lanza-grottie right? Wrong, it's a super cool island. Obviously the real draw here is the weather. At least about 20 degrees all year round, it's nearly always sunny, like the best summers day in England. It messes with your mind when you get off the plane having left a cold Wintry Britain straight into a lovely hot Spanish island. We stay in Playa Blanca a fairly nice resort on the south coast. Remember it's Spain, so there's some good food to be had as well (the islands in general are not as good as the mainland as they have a good proportion of Brits visiting, which lowers the standard in my opinion.) But you know me and Mrs Bacon always sniff out the best the island has to offer (some nice Chipirones pictured top middle,) reviews to follow. Normal service will resume on the 18th March. 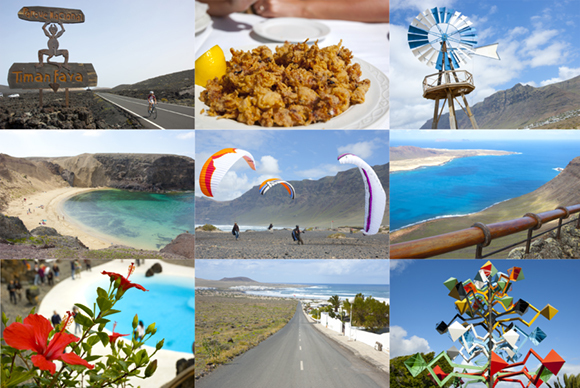 Have fun, I also love lanzarote and playa blanca is a lovely resort. Have you ever eaten at the restaurant at Timanfaya volcano? I heard they cook the meat on the volcanic rock.